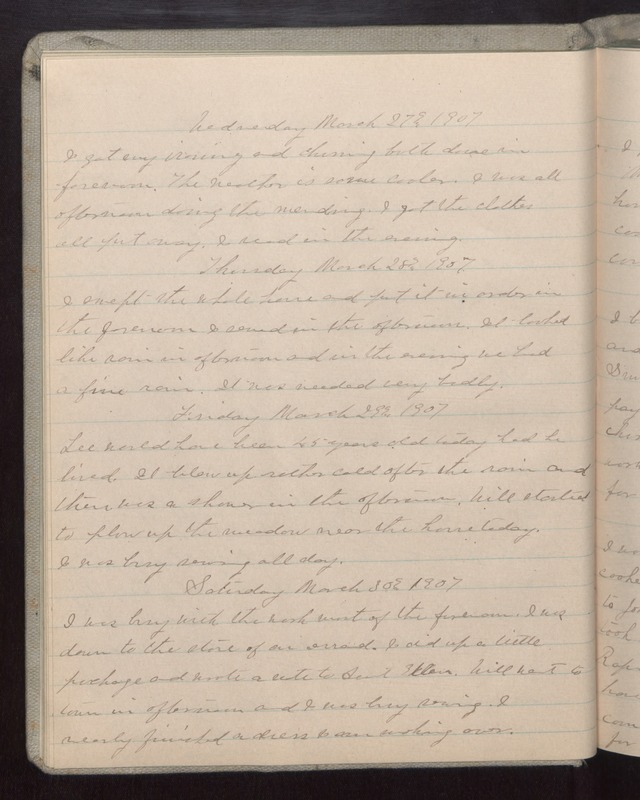 Wednesday March 27 1907 I got my ironing and churning both done in forenoon. The weather is some cooler. I was all afternoon doing the mending. I got the clothes all put away. I read in the evening. Thursday March 28 1907 I swept the whole house and put it in order in the forenoon I sewed in the afternoon. It looked like rain in afternoon and in the evening we had a fine rain. It was needed very badly. Friday march 29 1907 Lee would have been 45 years old today had he lived. It blew up rather cold after the rain and there was a shower in the afternoon. Will started to plow up the meadow near the house today. I was busy sewing all day. Saturday March 30 1907 I was busy with the work most of the forenoon. I was down to the store of an errand. I did up a little [illegible] and wrote a note to Aunt Ellen. Will went to town in afternoon and I was busy sewing. I nearly finished a dress I am working over.